The conclusion of the Leadville Trail 100 Run on Sunday saw three of the remaining 18 individuals vying for the 2012 Grand Slam of Ultrarunning fall from contention. The final event, the Wasatch Front 100 Mile Endurance Run, takes place on Friday, September 7 on a course that stretches from Layton, Utah to The Homestead in Midway, Utah. Wasatch has a cumulative elevation gain of approximately 26,882 feet. Look at all those Slammers gutting out 29s at LT100!! Love it!! Thanks for collecting / providing the data, but I'm curious why you sort them alphabetically by first name instead of by total time? 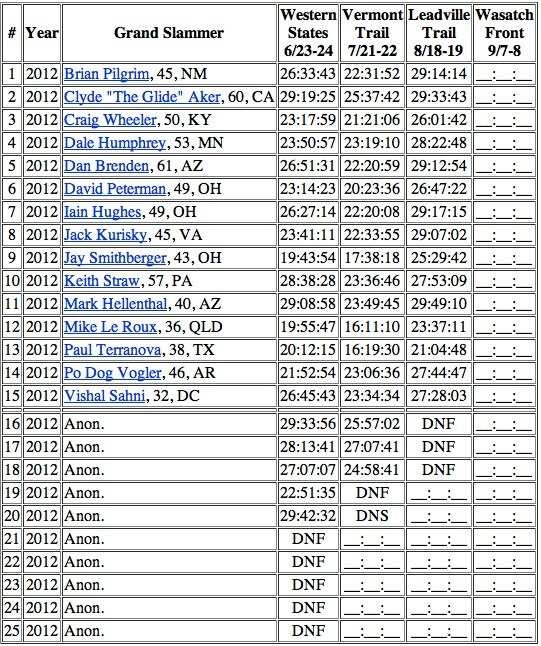 That is simply the way it is sorted by the Grand Slam of Ultrarunning. I suppose I could do a little bit of work and re-sort it out by total time, but perhaps after Wasatch.